by Emilio Gallocchio, President of Alstom Italia. [caption id="attachment_782" align="alignleft" width="150" caption="The ‘Pendolino’, the Most Exported Train in the World"] [/caption] A CHAMPION ITALIAN PRODUCT FROM THE HEART OF PIEDMONT - Its features and the ability to adapt to different national contexts make it an unprecedented commercial success. Few people know that Italy holds the record for the most exported passenger train in the world - the ‘Pendolino,’ produced by Alstom Ferroviaria in the Savigliano (CN) factory. More than 400 have been ordered in various countries, from Spain to Finland, Portugal to the Czech Republic, and Great Britain to China. This technological gem, entirely designed, developed and produced in Italy, has three salient features - the variable set-up, which allows the coaches an incline of up to 8° in bends (giving the train its name ‘Pendolino’), the engines on bogies and the coaches in aluminium alloy. These features give it, firstly, a travelling speed in bends 30% higher than trains with a fixed trim. There is also better acceleration from a standstill and starting torque (as a result of the distributed drive), less wear of the infrastructure (due to lower loads per axle), greater space for the transport of passengers (through the elimination of the locomotive). The ‘Pendolino’ can thus reach speeds of 250/270 kph on traditional tracks, without needing special high speed lines whose production ‘ex novo’ has very high costs and problems of acceptance, especially in countries with high population density. The ‘Pendolino’ is a train which adapts to different national contexts. Some models can use three different electrical supply voltages and recent models are fitted with the European signalling standard European Rail Traffic Management System. The 22 trains operating in Russia and Finland have greater gauge and are prepared for the winter so that they can operate in Arctic temperatures without problem. From this, it can be understood why the ‘Pendolino’ family of trains has been an unprecedented commercial success for 25 years, a champion of Italian products which accessed the world market as a result of Alstom’s global distribution, conquering railway companies in 10 countries and transporting more than 300 million people. The 53 ‘Pendolino’ purchased by the British company Virgin Trains in 2003 allowed it to win the prize as the ‘Best Railway Company’ in the country for punctuality and regularity of service in 2008. Today, several countries are focusing on the development of railway transport, both nationally and internationally - seizing even more opportunities to continue this international success story. FOUND IN MORE THAN 100 COUNTRIES, IT EXPORTS ABOUT 75% OF ITS PRODUCTION - The menswear brand Canali has opened its first Asian boutique in the Pacific Place Mall. 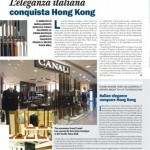 [caption id="attachment_674" align="alignleft" width="150" caption="Italian elegance conquers Hong Kong "] [/caption] Italian fashion continues to make headway in international markets; particularly aiming at the less ‘well-trodden’ paths where talking of Italian products is the equivalent of style, attention to detail and good taste. This is the case of Canali, a brand synonymous with sartorial skill and a symbol of Italian excellence in the world. 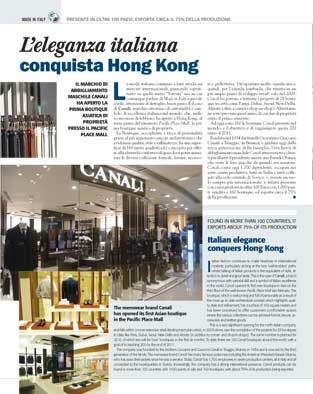 Canali opened its first own boutique in Asia on the third floor of the well-known Pacific Place Mall last February. The boutique, which is welcoming and full of personality as a result of the most up to date architectural concept which highlights quality, style and refinement, has a surface of 160 square meters and has been conceived to offer customers comfortable spaces where the various collections can be admired-formal, leisure, accessories and leather goods. This is a very significant opening for the north Italian company, and falls within a more extensive retail development plan which, in 2009 alone, saw the completion of the projects for 29 boutiques in cities like Paris, Dubai, Seoul, New Delhi and Almaty (in addition to corner- and shop-in-shops). The same number is planned for 2010, of which two will be ‘own’ boutiques, in the first six months. To date, there are 160 Canali boutiques around the world; with a goal of to reaching 200 by the end of 2011. The company was founded by the brothers Giovanni and Giacomo Canali in Triuggio, Brianza, in 1934 and is now led by the third generation of the family. The menswear brand Canali has many famous customers including the American President Barack Obama, who has worn their jackets since he was a senator. Today, Canali has 1,700 employees in seven production centers, all in Italy and all connected to the headquarters in Sovico. Increasingly, the company has a strong international presence. Canali products can be found in more than 100 countries with 1000 points of sale and 160 boutiques, with about 75% of its production being exported. by Sergio Luciano, Director of Economy A REFLECTION ON THE LAST DECADE, WHICH HAS SEEN STRUCTURE AND SPEED CHANGE IN THE WORLD - In this his latest book, the economist discusses the global crisis affecting the west, where the superfluous costs less than the necessary and where both the population and production is on the decline. And of how morale and principals can help us get through this period. [caption id="attachment_670" align="alignleft" width="150" caption="Fear and Hope by Giulio Tremonti "] [/caption] The ideological varnish of radical liberalism, so dear to the Chicago school of economists in America, served, in the 1990's, to cover up the myopic interests of a caste of both industrial and financial speculators who wanted no limits on their exports of goods and services to China and to Asian countries in general, which were then just beginning to emerge. To this end, the WTO – the World Trade Organization, in reality controlled by America – decided on 11th December 2001 to completely open the frontier with China, which virtually made it a member of the organization itself. 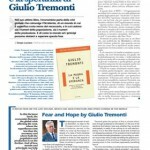 This decision, according to Giulio Tremonti, the strategy of the economic policy of the Italian centre right, was more damaging to the west and, in reality, to the balance of the world economy, than the destruction of the twin towers on 9/11. 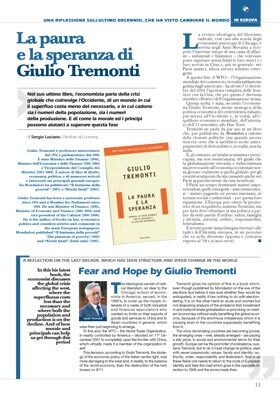 Tremonti gives his opinion of this in a book which, even though published by Mondadori on the eve of the elections (but before it was sure whether they would be anticipated), in reality it has nothing to do with electioneering. It is on the other hand an acute and worried but not despairing analysis of the problems that investment in and indiscriminate globalisation is provoking on western economies without really benefiting the global economy, because of the enormous imbalances which it is causing even in the countries supposedly benefiting from it. The once dominating countries are becoming poorer, the emerging ones – well, already emerged – are paying a silly price, in social and environmental terms for their growth. Europe can be the promoter of a rebalance, sustains Tremonti, but to do it must change its politics, start with seven passwords: values, family and identity; authority; order; responsibility and federalism. And in all these fields one needs to return to the roots of European identity and take the road which goes in the opposite direction to 1968 and the errors made then. 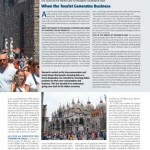 When the Tourist Generates Business by Augusto Strianese, President of Assocamerestero THE CCIEs IN THE FRONT LINE TO PROMOTE TOURISM IN ITALY - Research carried out by Assocamerestero and Isnart shows that people choosing Italy as a travel destination are oriented to choosing Italian products for their own consumption and business. This fact shouldn’t be underrated, giving new dash to the Italian economy. [caption id="attachment_658" align="alignleft" width="150" caption="When the Tourist Generates Business "] [/caption] All over the world, foreign tourists are a real economic value, able to create wealth for those working in the sector and the associated supply chain. They also reflect the image promotion processes of the country. 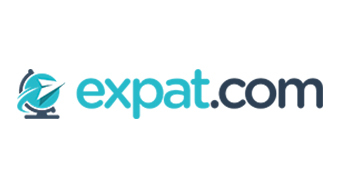 This is particularly true for Italy, where the experience of travelling is often associated with profound knowledge of the culture, products and the lifestyle in Italy and thus an important lever in regional marketing. MORE TRIPS MADE TO ITALY MEANS A GREATER LIKELIHOOD OF CHOOSING ITALIAN PRODUCTS. A survey carried out in 2008 by Assocamerestero, in collaboration with Isnart and supported by 64 Italian Chambers of Commerce in 43 countries (CCIEs), showed that travelling to Italy wasn’t just an experience of the style and quality of life - 96% of those interviewed said that a trip to Italy had a positive influence on the purchase/consumption of Italian products and one-third said that this had increased following a stay in Italy. At the same time, the perception of foreign companies improves with the trip helping Italy become a country in which to start entrepreneurial partnerships. More than half of those interviewed believe that Italy offers good business opportunities for the companies interested in extending their business abroad. The positive influence of the trip on the approach to doing business in and with Italy was further enhanced by about 37% of those interviewed, for whom direct knowledge gave an idea better than the expectations. This makes clear the potential that more effective promotion of tourism - more oriented to business and adequately supported by advanced communication tools - could bring to both the image of Italy overall and the partnership opportunities Italian companies would have with foreign ones. More recent data on incoming tourism leaves hope for a consolidation of the upturn in the sector in 2010 despite the natural fall in overnight stays (-6% on an annual basis) due to the international crisis. From January to November 2009, there were assets in tourist balance of payments in Italy of Euro 8.7 billion; 21% of the cost of foreign travellers in Italy comes from businessmen, whose numbers grew by 7% compared to the same period in 2008. These are significant percentages but there is plenty of room for growth. CCIEs AT THE SERVICE OF TOURISM IN ITALY The International Tourism Exchange, held in Milan from February 18-21, was an important opportunity for everyone in promoting tourism, at both national and local level. It was a chance to take stock of the trends in the tourist sector and thus reach the definition of a shared and coordinated marketing strategy in which each body could make a contribution, based on its specific features and competences. In this sphere, the CCIEs has acquired significant experience and has further refined its ability to aggregate interest in Italy as a tourist destination and business partner, arising from the agreement signed by ENIT and Assocamerestero in 2002. As a result, six observatories were started at Chambers in countries where the agency is not directly there. The CCIEs has always been committed to the performance of specific integrated promotional work aimed at incentivizing incoming tourism through the enhancement of the Italian artistic-cultural heritage and the products resulting from it. 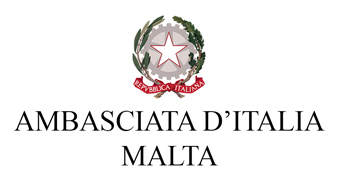 In 2009, the work carried out in the tourist sector directly involved local and Italian tradesmen through the organization of seminars, workshops, missions and B2B meetings at the main fairs. 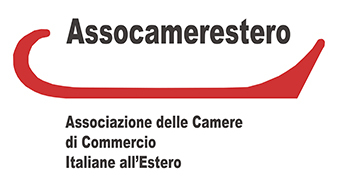 The Chambers have shown that they know how to reach business users with a strong orientation to Italy via their initiatives, through their nature of entrepreneurial associations. If this group is intercepted and ‘seduced’ with appropriate shrewdness, it could be a flywheel of growth and development for the whole country. As president of the Comitato Leonardo, Luisa Todini rewards all those who have held high the name of Italian products in the world. However, she also believes it should be the entrepreneurs who start to believe in themselves, their abilities and Italian excellence once more. [caption id="attachment_645" align="alignleft" width="150" caption="We should be Proud of Being Italian "] [/caption] Gianfelice Rocca, president of the Techint Group, the Artoni Group, Gennaro Auricchio S.p.A., the Brunello Cucinelli Group and the Trevi Group, as well as Rita Levi Montalcini and the Italian Civil Defense were all given prizes by the Comitato Leonardo in 2009. 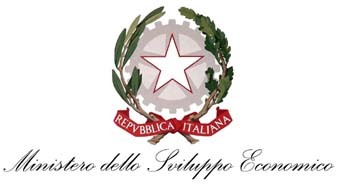 Since 1995, and under the patronage of the President of the Republic, the Committee has recognized the entrepreneurs and personalities who have been distinguished for their excellence, innovative ability and considerable international projection in the world, and who have thus contributed to strengthening the image of Italy in the world. Luisa Todini, president of Todini Costruzioni Generali S.p.A. which operates in the large infrastructure sector, has been president of the Comitato Leonardo. We discussed Italian products, the future of the economy and the role of young people, and the tenacity of Italian entrepreneurs with her. Ms Todini, for 15 years the Comitato Leonardo has been rewarding those have held the name of Italian products high around the world. In reality, what are the guiding criteria in the choice of the winners? The winners can be large, medium or small companies, but they all share the ability to excel in their sphere of work and have their excellence recognized and appreciated around the world. Nevertheless, we don’t just judge the ability to ‘do’ but also to ‘be’. We included the prizes we awarded, for example, to Rita Levi Montalcini (Lifetime Achievement Award 2009), the National Acrobatic Team of the Italian Air Force (Lifetime Achievement Award 2008) and the Civil Defense (Special Award 2009) in this direction. On the other hand, the concept of Italian products has been changing and expanding in the last 30 years. 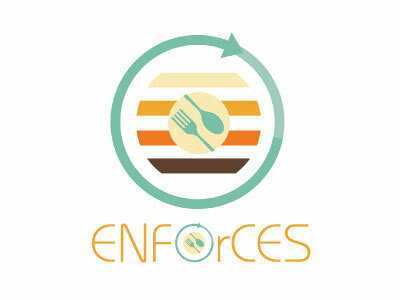 Once, it was the synonym for ‘Fashion & Food’ but it must now be extended to sectors like mechanical engineering, logistics and construction and has a series of values which are universally recognized - and are our excellence. Even so, we ourselves often question our role. One example is the recent controversy with Anna Wintour, editor of Vogue America, on the excessive length of the Milanese Fashion Week. Most Italian stylists ‘gave in’ to her requests to have the shows in just four days, which enraged Mario Boselli, president of the National Chamber of Fashion, and caused the Comitato Leonardo to step in on the subject. As we commented in the joint note transmitted with Fondazione Altagamma, we’re convinced that Italian entrepreneurs are tenacious and they have shown this gift on more than one occasion. However, they have to recover that pride, that strong personality which has always been their feature, which enabled them to establish themselves in the world, and enabled Italian products to achieve the role and weight they have today. However, we should not forget that it’s not just the individual, famous stylists working in fashion, but also a supply chain behind them representing 4% of the GDP and employing more than 500,000 people. At the same time, young people must be given the right amount of space, as they will be the great stylists of tomorrow. Talking about young people, you advised them to do two things in a recent interview - learn English well and gain experience abroad. Absolutely. If, on one hand, English is the language of business, and is essential if you’re working in international markets, I also believe that experience abroad is fundamental. 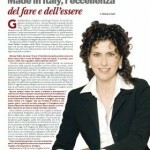 It helps growth and opening - and a return to Italy with new competences. Mobility - physical and mental, professional and cultural - is an indispensable value, in my opinion. Despite the difficult world economic situation, the Todini group has continued to grow. What do you think are the factors which have enabled your company to achieve these results? What would you like to advise entrepreneurs to do to ‘jump onto’ the hoped-for upturn? The merger with Salini Costruttori has undoubtedly had a very positive impact for us. The third largest Italian company in the construction sector emerged from this merger and the growth in our size has certainly been fundamental in enabling us to face important challenges, projects and investment. The same can be said for the foreign markets. As the Todini group, we could be found in 12 countries but now we work in 40 and this allows us to amortise the risks - so diversification of the markets is a piece of advice I feel I can give to those with an international vocation, obviously without biting off more than you can chew, particularly in terms of investment. There are the bases for an upturn in the economy but we must still remember that Italy is ‘paying’ for 15 years delay, with a GDP which is lower by 1% annually than the European average, despite the growth in GDP of recent months; however, there are still difficult months to face. You went into politics in the past and were a Euro MP from 1994 to 1999. In the end, you abandoned that road to dedicate yourself to the family company. Do you have any regrets? My decision was a choice and, at the same time, a requirement, connected to the death of my father in 2001. Quite honestly, though, I think that an entrepreneur is in politics every day - every single job created is a political act. In addition, in my role of president of the Comitato Leonardo, as in that of vice president of the Institute for Industrial Promotion, I can make my contribution to these important questions, on work, on the promotion and development of the country. This, for me, is being ‘political.’ But then, never say never. For the time being, however, with work, the family and a small daughter, I’m not thinking about any commitment to active politics. During the G8, you spoke in Rome at the meeting with the women from the entrepreneurial, culture and political worlds. After your speech, even the Libyan leader al-Gaddafi, went up to you and said, “You’re a man, not a woman.” Did this comment flatter or irritate you? It was a very particular context; there was a discussion on women’s rights, policies in favor of women and the need for equality between men and women in all spheres. When al-Gaddafi said that to me, I thought I should ask him if it was a positive comment. He assured me it was a compliment, paying homage to my abilities. And I accepted it as such.